Everything's coming up Anne (with an e). PBS just released an updated version of Anne of Green Gables, apparently ignoring the fact that the Megan Follows version is the One True Version (though I will still absolutely be watching online when I get the chance -- my station didn't air it?!). Anne is also coming to Netflix (? ! ? ! ), proving that everyone's favorite redhead is here to stay. And what's more? 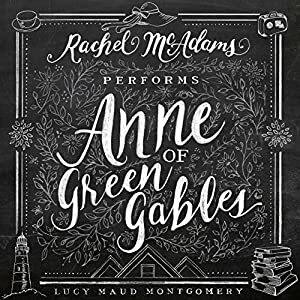 A brand new audiobook of Anne of Green Gables, read by everyone's favorite sometimes-redhead, Rachel McAdams, has just been released! If this is not holiday kismet, telling you to buy all of the kindred, bosom friends on your list something appropriately Anne-worthy, and maybe re-indulge in the antics of a certain carrot-y, precocious orphan yourself, I don't know what is. A lot of you probably already know all about the connection I have to this book, because I've talked about it oh, a time or ten. I don't think I could count on both hands the number of times I've read this book and others in the series; it's one of my most long-standing favorites, and one I know I will continue to reread well into my dotage. But I have yet to listen to it on audiobook, and I really couldn't think of a narrator that would make me more happy than Rachel McAdams, so now seems like the perfect time! You can check out Rachel talking about the book and the process of recording it in this peek behind the scenes (below), and you can grab a copy of Anne (or any other Audible audiobook!) as part of a free 30-day trial! They have an insane unmatched selection of audiobooks (including Amy Poehler reading her book, Yes, Please, which is probably a thing you want, because obviously), and they are also Whispersync compatible, meaning that you can switch back and forth from reading the text on Kindle to listening to the audio on your commute! That is pretty handy, if you ask me. And I do keep saying that I need to up my audiobook game and start using audiobooks as an incentive to clean the house or work out. . . New Year's resolution, perhaps? Let me know your thoughts on this Anne + Rachel pairing in the comments, and/or who you'd like to see read your favorite classic! And if you have any audiobook recommendations for me, I'd love to hear them! Start your free 30-day trial of audible here, with a free download of Rachel McAdams reading Anne of Green Gables, OR any other book from their vast selection -- your choice! I love LM Montgomery's books and especially her Anne books. I think Rachel McAdams is a great fit for the story. I'll have to put this audio on my list.